Ya, that was the problem, his review only mentioned 240P through scaling with external devices (framemeister), I couldn't make out anything about it being native. The Sonys handle 240p rather well COMPARED to other flatscreen TVs. With the option to choose single field deinterlacing you even get proper handling of 240p flicker effects. Still the quality is far from anything you get through a video processor and if you plan to really use 240p sources, it's just a sin NOT to use a proper linedoubler or upscaler. I don't recall seeing any mention of these in the thread. Are these new features? Is the X950B out in the US ? Portable Game modes are available on the W series as well. Those are meant for PSP playback. Doesn't look great though. The 65" X950B ships in a month from now. I hope 3x brightness feature translates to having a brighter impulse mode with less flicker. I so want this one. Sony still hasn't announced the 65" X950B for Europe. If they don't bring it over, the Toshiba 65L9400 seems to be the next best option. Confirmed ultra fast game mode and full backlit LED dimming. Where has ultra fast game mode been confirmed? Did Toshiba include a display port input for full color 2160p60? 10ms input lag on a UHDTV sounds too good to be true! Did Toshiba include a display port input for full color 2160p60? no, but with true HDMI 2.0 it shouldn't be neccessary. 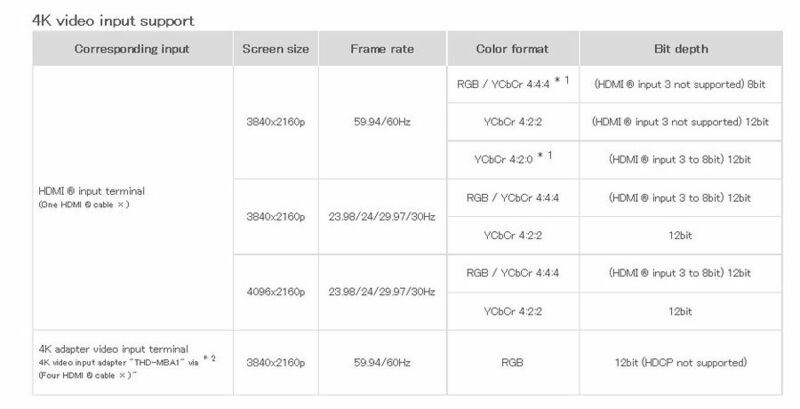 Only 2160p60 4:2:0 is part of the HDMI 2.0 spec. 4:2:2 & 4:4:4 are not supported. We'll see... The HDMI 2.0 spec has some ambiguous parts to it - being able to state HDMI2.0 capability without supporting all features/modes. On top of that, the current Sony specs for the X950B explicitly list 2160p60 as 4:2:0 8-bit. Hence, Sony might not be using 18 Gbps capable HDMI receivers! Those are some sick monster displays too expensive for me though. I don't need it, but I don't mind it either. It's potentially very nice for 720p upscaling (720px3=2160). Definitely. That, and the fact that dead and stuck pixels will be harder to spot is what's interesting about 4K. Mmh... I saw Sharp's 8K prototype with my own eyes in Berlin and at maybe 1m away I could definitely see the dots (strangely shaped by the way), and one thing's for sure: if one pixel died on that thing it would be noticeable. But it was freaking huge (about 85") which kind of spoiled the pixel density. Pity even with the b series, Motionplus Impulse strobing remains unusable for me. It fixes flickering, but its low luminance still remains meaning it can still not match tubes in flexibility. Can Vizio achieve with their new models what Sony couldn't? We'll see. I consider the Panasonic S60 superior gaming flat panel to the Sony W650 that's why I own one. I still wouldn't call mine the best gamer's flat panel for 2013. That honor should go to one of professional Panasonic plasmas which have ultra low input lag in addition to godly motion resolution. So, instead of getting rid of tubes, I recently added a new one. I already have the BVM so I got the 34 inch XS955. Should be fun to experiment. where did you find confirmation for that ? The Panasonic plasmas definitely aren't as fast as the Sony sets. But they certainly look better. Good, but lacks the super low input lag. Too bad they didn't pick the 2014 W7 instead. interesting tidbit about the VGA port on those models. However, if you've seen VGA transcoded to component to converted to HDMI once, you won't go back to direct VGA. The VESA/SMTPE mismatch really makes me wonder why I've deal with VGA for so long before. Hi, I've been reading these forums over the years but now I need to ask something, so I created an account. Nice to meet you all! Would be this Sony W series a good choice? I'm afraid to improve on some aspects but to be worse on others (ghosting being my main concern) and also angle viewing, because I have to hang it a little up over my sight view. PS. I also play sometimes on a Samsung HD ready plasma (2013) and I'm very proud of it. Seriously, I'm just afraid of ghosting. What's the difference between the X900A and the X950A? X900 is edge-lit, while the X950 has (or will have) a full backlight behind the panel. I guess those should be B's rather than A's also. Shame I can't fit a 65", local dimming would be great. I think you mean motion-blur. Motion blur is always going to be a problem with LCD's. However, this one has backlight strobbing which creates flicker, which reduces motion blur. Unfortunately, I've heard many reports that this strobbing makes the picture way too dark (others may disagree). No worries. You'll not improve on ANY aspect with a LCD. Contrast will be far worse, motion clarity will be far worse, color accuracy will be worse, and I could go on and on. Once you go Plasma, downgrading to a LCD is not in your best interest. Solution? Snap up a Panasonic VT series from last year (virtually perfect blacks, they are the most amazing plasma's ever created). In terms of picture quality sure, but no plasma TV ever featured an input lag as low as the current Sony W series does. They could have, but never did. Otherwise everybody would have been gaming on plasmas for a long time. The Sonys feature standard VA 1080p60 panels, and of course there's a degree of ghosting and motion blur, but they're still the fastest 'big' displays for gaming in terms of input/timing. And that's all the reason why they've gathered so much attention. It's up to the user to choose low lag over picture quality and vice-versa. Sometimes the Panasonics make me drool, really, but now that I'm used to the the Sonys quasi-instant response times, it's hard to go back.